School-going and college students regularly need new stationery, including notebooks, pens, papers, calculators, diaries, staplers—the list goes on. These supplies help facilitate the workings of a student or an employee as they would need to use stationery supplies for different tasks during the day. Supplies that are regularly needed at the workplace, like toners and ink for printers, staplers, printing paper packs, etc. can also be ordered at once from one of the many office and school supplies dealers online or from the neighborhood store. Both office and school supplies are integral for the smooth functioning of offices and schools without disruption of schedules and duties. Stocking up office and school supplies well in advance, by making a bulk purchase, can save you a lot of money. You can save on any sort of inconvenience that may arise in the case of no stationery stores being available when you need one the most. You will have to make a list of the office and school supplies that you need if you want to make sure you do not leave anything important out. Most common items on the list are binders, book covers, dry erase boards, erasers, calculators, storage boxes, folders, toners and ink for printers, scissors, envelopes, tape, timers or stopwatches. 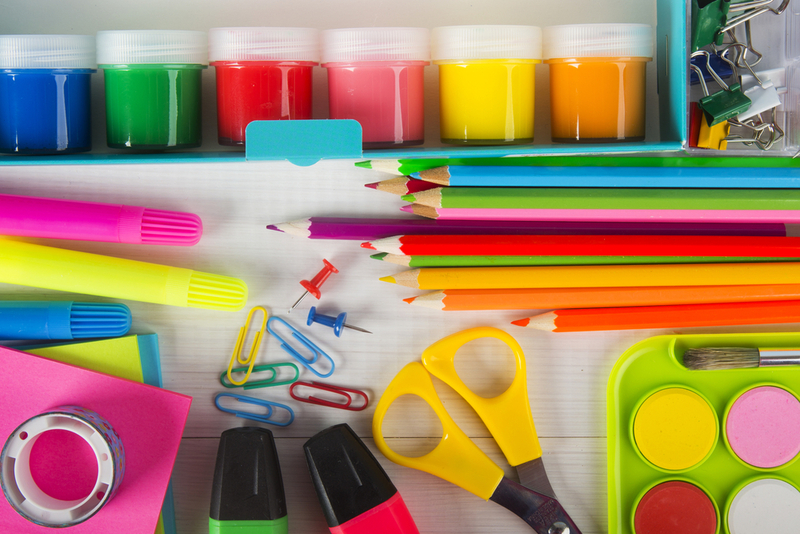 Some stores that offer special office and school supplies include Quill, Office Depot, The Green Office, Best Buy, Mead, Rifle Paper Co., Poppin, and Shoplet. A majority of these stores have a large range of supplies and announce great discounts from time to time. If you like your stationery in bold and lively colors, Poppin products are likely to catch your fancy. Poppin is a brand that offers personalized office products like self-inking letter address stamps, return address stamps, stow 2-drawer file cabinets, stackable letters tray, Present Yourself Interview Portfolio Collection, hanging file folders, zip folios, clipboards, tape dispensers, file boxes, business card holders, staplers in a range of attractive colours, pen cups, etc. Most of the Poppin office and school supplies are available on various online stores at great discounts. Office Depot also has an online store now and ordering from here is quite convenient. They have prompt shipping options. OfficeSuperSavers.com offers bulk deals on office and school supplies from top brands. Their Craft section is a major draw for school-going kids. Regular discounts are available for quilting, scrapbooking, painting, quilling, and other hobby activities. Mead is another popular office and school supplies store that has created a recall value for itself over decades. It is a trusted go-to place for all office and school supplies needs. They also source innovative and unique supplies that are especially appealing to college-going kids. Concord supplies specialize in selling a dynamic range of ink and toners. So, if you need to place an order for the office, ordering from here is likely to get you good products at great discounts. Rifle Paper Co. is famous for its customized stationery; they often have a great range of eco-friendly paper products, attractive diaries, and journals in different designs, including eco-friendly materials, themed calendars and planners, and a whole range of other office and school supplies. Target has an exhaustive range of office and school supplies. What’s more, there are excellent discounts on these products from time to time. At Target, you can select from a vast range of organizers, writing supplies, tools and equipment, filing materials, notebooks and journals, boards and easels, calendars and planners, labels and label makers, locker accessories, paper, sticky notes, tapes, adhesives and fasteners, ink and toners, and many other supplies.